2 weeks until I turn 23! Can I just say I am feeling a bit old? I honestly felt that by now I would have my life somewhat together but God has other plans and I'm learning that it's ok. It's been a crazy-ish couple of weeks with doing a lot of prep for my ReachOut exam stress presentation and ReachOut stall at the mental health expo next Thursday. I like my stalls for ReachOut to have an element of interaction with a fun game, last year I made ReachOut memory cards (which are laminated) which went down really well at past stalls but found they didn't work at the expo last year so I have been printing off a variety of images and captions to do a simpler version of What Do You Meme game. Which has been tedious but will be worth it (again I will be laminating it so I can reuse it) and its coming together nicely. My talk has been written, and I think I am happy with my PowerPoint presentation but knowing me I will keep changing it until the day before! I printed out my talk and its been in my bag so when I get a spare moment I can go through it. My aim is to mostly speak from memory but have my speech printed out for reference. I will be a doing a recap on the expo next Thursday/Friday depending how tired how I am after it all (did I mention I am giving the presentation twice as it's meant to be so popular!). different style to what I normally get done but its more adult and I am loving it being longer in the front. Moving onto Five Friday Favourites. A Cinderella Story if the Shoe Fits - I love all the modern Cinderella remakes and A Cinderella Story is one of my all time favourite movies, so when A Cinderella Story if the Shoe Fits appeared in the new release section of Netflix I had to watch it. I really enjoyed it and loved Sofia Carson in it, it's a good Friday night chick flick and a must watch if you love the previous Cinderella Story's. Echosmith Future Me - I really liked this song and while it was faster paced compared to their other songs it was really good and the video clip (below) was really well done. I can't wait until their new album is released in a few weeks time. 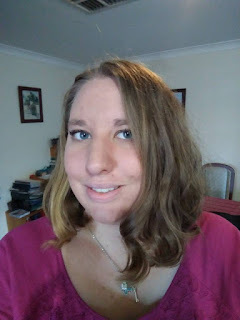 How Volunteering Helped Me Own My Anxiety and The Lies My Anxiety Tells Me at Night - my fourth and fifth articles to be published on The Mighty! Both articles are close to my heart and the latter was really big for me to write as it had been in my head for so long but I didn't have the courage to write it until now. I highly recommend that you read them if you haven't yet and let me know what you think. Every Witch Way - I was sick the other weekend and needed something I could relax and watch. I remembered this series as it had Rahart Adams in it who is celeb ambassador for ReachOut and thought I would give it a go. I have actually really enjoyed it so far and its been a great series to just chill out and watch. It's a bit predictable and the acting isn't the greatest but it is a Nickelodeon series so I wouldn't expect it to be a masterpiece. Liptember Beauty Box - I ordered this box last year and I loved it. For $40 you can buy a beauty box filled with amazing products with all proceeds being donated to Liptember. Which is an event to raise awarness of womens mental health and raise funds for womens mental health research. Last years box was filled to the brim with goodies, so not only do you get beauty and health products you know that the proceeds are going towards a great cause.